Meet the 2 unofficial stars of this blog. Tween#1 and Tween#2. 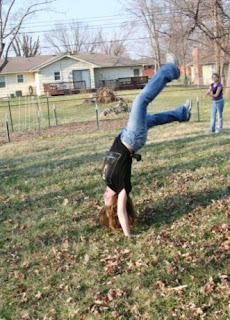 Kate is showing off her tumbling skills. Kate is the oldest tween. Soon to be a full fledged teenager, a scary thought to dear old Dad. She can be found most times in her room, cell phone clutched in hand, fingers flying across the keyboard, with the phone glued to her ear. Kate is the drama queen. The "omg, I-am-going-to-die-if-" drama queen. She also is the keeper of goofy faces, all things girly, an overflowing closet and shoe rack. Mary is the second in command tween. Mary is the little monkey. Most likely to be found stomping in mud holes. Or telling some boy who messed with her that she is going to stomp one in his. Mary is the anti-girly girl. 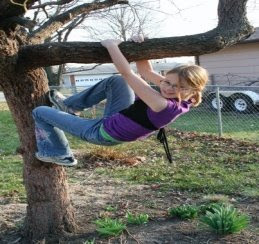 Her domain consists of hanging in trees, taking apart things in her room, or telling on her sister. She is the great debater. Mary is the keeper of all things involving outer space, her dad's tools, and silly jokes. Now you have met the two faceless kiddos who can destroy a clean house in 60 seconds flat. Who I probably blog about more than I should. Stay tuned for tomorrow, you can meet the fur kids who inhabit the geek and belle home. My kids also like to mess up the house. My husband does too, actually.